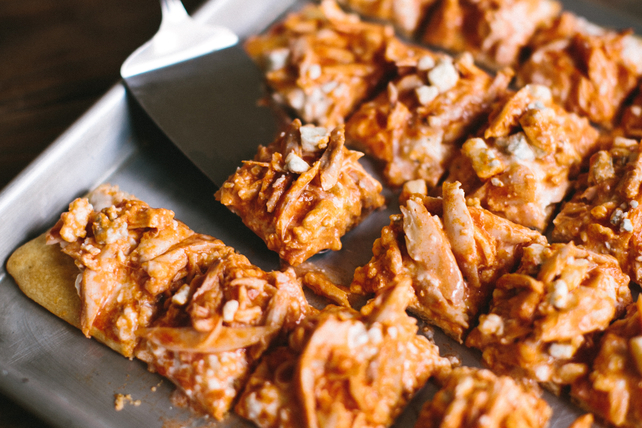 Ranch dressing, hot pepper sauce and crumbled blue cheese means this chicken pizza appetizer is sure to be a hit at your next get-together. Unroll dough onto 15x10x1-inch pan sprayed with cooking spray; firmly press perforations and seams together to form crust. Bake 9 to 11 min. or until golden brown; cool. Mix cream cheese and dressing until blended; spread over crust. Mix chicken and wing sauce; place over cream cheese layer. Top with remaining ingredients. Refrigerate 1 hour. Cut into squares. Purchasing a fully-cooked rotisserie chicken at the supermarket is a quick way to obtain cooked chicken for recipes. Check to make sure the chicken is hot, not just warm, when you purchase it. If you are not using the chicken immediately, cut it into pieces and store in tightly covered containers in the refrigerator for up to 3 days. To easily shred cooked chicken for recipes, place the slightly cooled cooked chicken on a cutting board. Use two forks or your fingers to pull the meat lengthwise into opposite directions, separating it into long shreds.